It wasn't too long ago that I enjoyed using DV Matte Pro for Final Cut Pro 5 and Express 2. I found it to be easy to use from the get-go and while there were parameters that would take some time to fully learn, it was only in the extreme fine-tuning that they would come into play. Lo and behold, someone at DV Garage has been keeping his or her nose to the grindstone, and here we now have Dv Matte Blast for Motion 2. This is one incredible piece of software.... Its applied quickly, is thoroughly effective and works in real time. I threw on some old, somewhat poorly lit green screen shots in Motion 2, applied the DV Matte Blast as one would do with any filter, made a couple of minor adjustments and viola, an excellent final product. As they say on their website advertisement, this really is a no-nonsense, blazingly fast keyer which easily handles everything from DV to HDV to HD. Because it was written to use Apple's FxPlug architecture, dv Blast uses the Graphics Processing Unit to order to achieve high quality, real time keys. 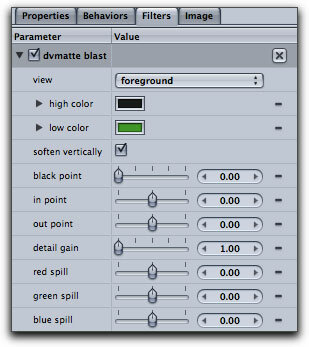 DV Blast's streamlined control parameters just make it easier to use. While some of the parameter adjustments found in DV Matte Pro for FCP 5 have been eliminated, I found no problem working with Blast in Motion. Those features, light wrap, color matching and a few other fine-tuning controls, have simply been built in and automated for speed. Trust me on this, DV Blast is fast and, if anything, it seemed to go smoother and with greater ease. In Motion 2, while using dv Matte Blast, you can adjust the key on the fly in real time whenever you want. It worked flawlessly. With my G5 sounding like a jet engine in this California heat wave we've been having lately, DV Matte Blast didn't even push the computer to Cessna level. Installation was super easy and uncomplicated. 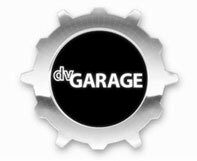 As they provided with DV Matte Pro, a 15 minute video clip (having Quicktime 7 is advised) is available, free, on their website to help you get started. A manual and a trial software download are also there for you to peruse. This is a real boon to the user and I encourage other companies to follow suit. Too many strand the new owner of software plug ins with little documentation or tutorials instructing how best to use their software in order to get the dazzling effects their sites promote. Bottom line, for those who are in need of some serious keying software, DV Matte Blast for Motion 2 is just that, a blast to have and use.